Whimsy has grown into a delightful DoodleMama. Her folks are Yuki and Fletcher and we think that she got the best of both of them. She is an F3 GoldenDoodle. 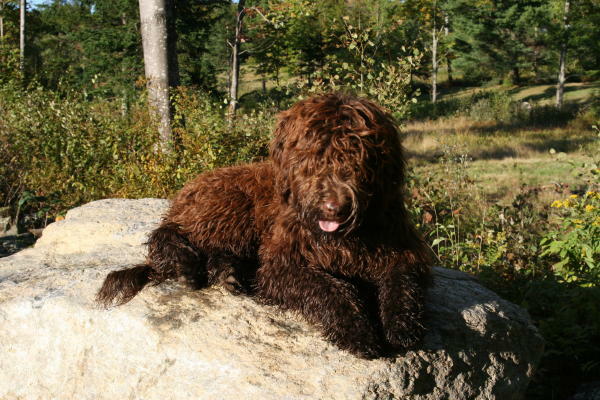 She has a stunning chocolate wavy fleece coat with a unique pewter undercoat and the perfect temperament. 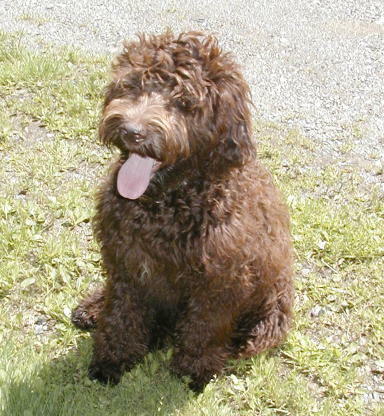 She is a third generation GoldenDoodle and has matured to around 50 lbs. She has her father's manners and comes on call to sit and ask what's up next? She has followed in her parents paw prints with strong test scores and we love her colorful litters. We believe that sizing down goldendoodles should be done over time and over several generations to maintain the integrity of the structure of the dogs. Mating Whimsy with Tino has given us the beginnings of our "mini" golden doodle lines. When Whimsy is not busy with puppies she lives full time with her Gonyaw family and loves romping through the gardens. We are anticipating another wonderful Whimsy and Tino litter in mid-March. Stay tuned for news to confirm.